Timberland Supply is pleased to provide chainsaw sharpening services in Edmonton and the surrounding areas of Alberta. Apart from engine power, one of the main determining factors in the cutting effectiveness of a chainsaw is how sharp the saw chain is. Keeping the saw chain sharp makes your job much easier and prolongs the service life of not only the chain but also the guide bar and chain sprocket. 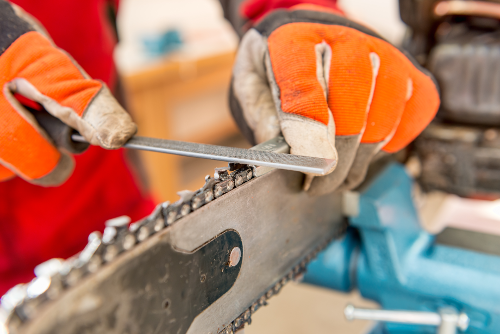 While you can certainly sharpen your own chainsaw, unless you are familiar with the proper technique and have all the necessary tools, chances are you won’t be able to do the job as well as we can. Our saw chain sharpening services are very affordable, and will save you a lot of time. If you’d prefer to try sharpening your own chain, the following video from STIHL explains how to do so.